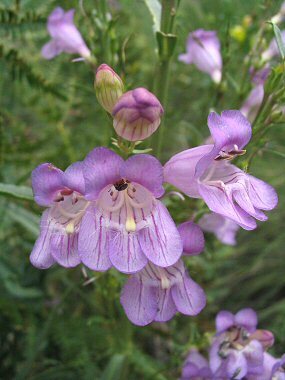 Narrowleaf Penstemon is a member of the Snapdragon or Figwort Family. It grows to 18 inches in height and as its name suggests, has narrow leaves which point upwards all along the stem to 0.75 inches in length. The plant typically grows in dry slopes and clearings in pine forests at elevations between 4500 - 9000 feet. Narrowleaf Penstemon has a branching root system. Narrowleaf Penstemon typically blooms between June - August and produces lavender to bluish purple flowers to 0.75 inches in length which have 2 upper and 3 lower flaring lobes.